BENGALURU: To improve existing irrigation methods and agricultural productivity in the state, state government in association with 2030 Water Resources Group have come up with the idea of ‘Multi Stakeholder Platform for Water’. On Monday a steering committee was launched with stakeholders from the public and private sector, the civil society, the industrial sector and academia with an intention to make transformations to the existing water management systems. “This is an initiative to find a new approach to improve existing irrigation methods and agricultural productivity in the state. 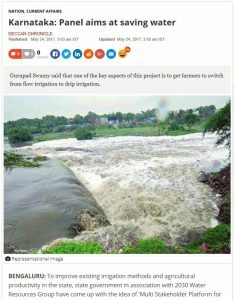 The 2030 WRG has provided a platform for all units of the Water Resources Department to work together on the agrarian crisis that Karnataka faces,” said Gurupad Swamy, Secretary, Water Resources department. He added that one of the key aspects of this project is to get farmers to switch from flow irrigation to drip irrigation.